Update 06 July: After receiving a device with an updated camera firmware we re-shot the samples and have updated the text below. The LG G4 may have the most advanced camera on the market right now, the company has updated basically every component. It starts off with a bigger 1/2.6" sensor with 16MP resolution. 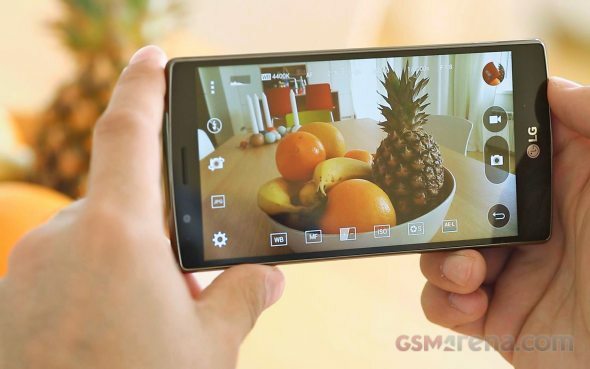 It's positioned behind a wider f/1.8 lens, which lets 80% more light in compared to the LG G3. The company has also updated the optical image stabilization, which now works on three axis (up from two). LG's Laser autofocus is back, but there's a new addition - the Color Spectrum Sensor. It detects ambient light for more accurate white balance. The software has been improved to match the impressive hardware. The LG G4 offers three shooting modes - Simple, Basic and Manual. The first is plain point & shoot with no options, then Basic gives you the usual phone camera options and finally Manual gives you full control of the capable camera. This includes focus, shutter speed, exposure and ISO and you get a histogram to aid you while adjusting the settings. There's an Auto Exposure lock too. If you want to do adjustments after taking the shot, you can enable the DNG RAW option. Compared to the LG G3, the new camera sensor has a 16:9 aspect ratio meaning it captures more horizontally (but less vertically). The improvement in image quality is the other thing immediately noticeable. You don't even have to go to 100% zoom, the LG G4 camera has noticeably better dynamic range and captures detail in the shadows while keeping the highlights from getting overexposed. The colors are more true to life as well. Once we do get to looking at the pixel level, the higher resolution offers some advantage, but really the amount of captured detail is much higher than the extra 3MP suggest. There's less noise in photos and the camera doesn't sharpen them as much. We had some issues with missed focus though and several of our shots were out of focus when we came back to the office after an outing for camera samples. Having a wide f/1.8 aperture means you can get some sepparation between your subject and the background. The blurred area (or bokeh) is most pronounced when you're shooting the subject from a closer distance (macro). Take a look at the bokeh you can expect of the LG G4's camera. Enabling HDR mode doesn't do much for the actual dynamic range. It seems to reduce the contrast and saturation more than anything. The images also come out softer since they are composed of multiple shots and the software doesn't align them perfectly. For some reason the updated LG G4 produced blurry HDR images more than half of the time. We suppose this could be a software issue that is limited to our unit as we did get HDR shots in perfect focus (such as the one below). The updated LG G4 unit produced noticeably more colorful images and a warmer tone. We'd say the color profile has gotten more unrealistic but does make for punchier images compared to the LG G4 we tested erlier. Otherwise the detail levels, sharpness, noise and processing all look the same. You can do some pixel-peeping yourselves if you like. The LG G4's 8MP selfie should easily outclass the 2MP shooter of the G3. It is slightly wider, allowing you to capture more of the scene behind you and it has a better dynamic range. It does capture more detail too, though the difference is much smaller than the resolution advantage suggests. The white balance is warmer though not perfectly accurate without the benefit of the spectrum sensor. Panoramas are nothing short of stunning, LG's updated software (with the help of the new chipset) can stitch an image up to 104MP resolution. The vertical resolution is over 5,000px, that's more than would fit on a 4K TV! The stitching is seamless, even up close, and the image maintains an even exposure across the whole frame. Of course, with an aperture like this the LG G4's true strength becomes apparent only after dark. The camera dials the noise reduction all the way down, resulting in a lot of visible noise at 100%. This does preserve a good deal more detail than the G3, which resorts to Night mode. The G4 does not, it just shoots at 1/10s shutter speed and relies on the OIS to keep things steady. The bright lights of store windows are handled better too. Here are our charts photographed with the LG G4. Note that we shot in 4:3 mode to match most of the competition. The LG G4 video camera tops out at 2160p resolution and 30fps. It has a 120fps slow-motion mode at 720p, but no 60fps mode, even at 1080p. Anyway, at maximum resolution the LG G4 uses 30Mbps bitrate, 156Kbps of which go to stereo audio. These numbers are unchanged since the G3. Competing flagships (like the Galaxy S6) use up to 48Mbps for the video and 256Kbps for the audio. Now that the aspect ratios are equal, we can see that the LG G4 camera is wider, capturing more of the scene. Videos also benefit from the better dynamic range and accurate color rendering. The LG G4 after the update captures slightly better, sharper 2160p video. Colors are also more vivid but the white balance is still accurate. 1080p videos drop to the standard 17Mbps bitrate. They exhibit some fairly noticeable oversharpening halos and look about average. The 720p @ 120fps mode eats up 24Mbps, but it's a waste - the actual resolution is closer to 360p. The footage is smooth at least, it can be played back at 1/4 rate for a slow-mo effect. You can download an untouched 2160p video sample and a 1080p@30fps sample for a closer look. Here's how the LG G4 stacks up against 2160p and 1080p competition. Note how the 1080p video use much stronger sharpening.